WHEN A Washington Post column described Marco Rubio as being "a bit at sea in terms of his next step politically," the Florida senator was irritated. "Another genius line," he tweeted acerbically. "I have only said like 10000 times I will be a private citizen in January." That was on May 16 — two months after Rubio dropped out of the presidential race and long after he'd made it clear that whatever came of his White House bid, he had no interest in another Senate term. "I am leaving the Senate; I am not running for reelection," he said firmly during a Republican debate last fall. Rubio's frustrations with being a senator were widely known. "I've worked in the Senate for four years, but I'm not of the Senate," he told TV interviewer Sean Hannity on Sept. 30. "That's . . . why I'm not running for re-election, and instead I'm running for president." Politicians are routinely faulted for flipping and flopping, but on this, at least, Rubio has been unwavering: "I'm going to finish out my term in the Senate . . . and then I'll be a private citizen in January." No doubt you'll be shocked — shocked! — to learn that Rubio is suddenly thinking he might not want to give up the perks and privileges of being a senator after all. Forget all those avowals to the contrary. And while you're at it, forget Rubio's well-documented disdain for Senate life. "We're not going to fix America with senators and congressmen," he may have scoffed in January. But that's when he thought he was going to be president. Now, with Florida's filing deadline just days away, Rubio's stance on a reelection run has swerved from an emphatic "no" to a wide-open "maybe." The Orlando massacre, he claims, has caused him to reconsider "how I can best serve." Or maybe it's the coaxing from Republican leaders in Washington, anxious to retain control of Florida's Senate seat, that has changed his mind. Or could it be the fear — as he put it in another tweet — that "it's nearly impossible for someone not in office to ever become a successful candidate for President"? It's an old, dispiriting story, this inability of incumbents to relinquish the authority and adulation that come with public office. If Rubio reneges on his commitment to leave Congress when his current term is up, he won't be the first. Politicians on both sides of the political aisle have won office by promising to serve no more than a specified number of terms — only to decide, once those terms were up, that it would be a woeful mistake for them to yield power. One notorious example was Marty Meehan, a Massachusetts Democrat elected to Congress in 1992 by fighting to limit incumbency, beginning with his own. He pledged repeatedly that he would leave after four terms in the House, and reiterated that pledge in office. Adamantly, repeatedly, Marco Rubio insisted that if he didn't win the presidential nomination, he would leave the Senate and return to private life. "The best test of any politician's credibility on term limits," Meehan said in 1995, "is whether they are willing to put their careers where their mouths are and limit their own service." He even signed a letter, prospectively resigning from the House at the end of the 106th Congress. But when the time came to leave, Meehan stayed, and ran for reelection four more times. Forced to choose between his credibility and a seat in Congress, he decided credibility could wait. 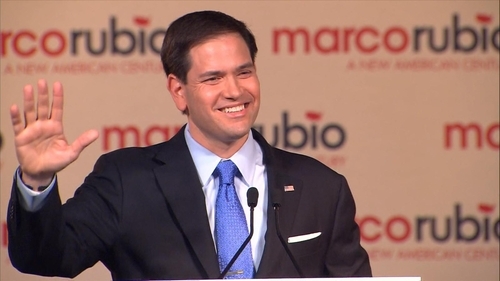 In terms of sheer politics, there may be good reasons for Rubio to seek reelection. But even if he retains his seat — no sure thing — will it be worth the price paid? Wasn't the politics of bad faith what Rubio claimed to oppose? Won't he be providing fresh evidence that politicians are not to be trusted? Henry Kissinger famously described power as "the ultimate aphrodisiac." It is also intensely addictive. The craving can overpower good judgment and integrity. Rubio said "like 10000 times" that he was leaving the Senate. That's why he should leave. June 22, 2016 update: Marco Rubio today announced that he would run for re-election to the Senate, officially abandoning his pledge to return to private life in Florida.